One of the nation’s top wine educators, Marianne Frantz is committed to making wine more approachable and appealing to everyone - from first-time sippers to aspiring experts. Whether teaching classes, speaking to large audiences or connecting through social media channels, Marianne's unique approach to wine makes learning easy and fun. 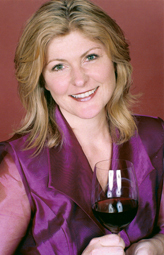 Marianne is founder and president of American Wine School. Since 2001, more than 10,000 students have taken classes at the American Wine School ranging from the popular Wine 101 to advanced certificates offered through the school's partnership with the Wine & Spirit Education Trust of London. American Wine School classes are offered in Cleveland, Cincinnati, Chicago, Pittsburgh and Sterling, Va. The American Wine School also sponsors tastings, events and seminars. Click to find out more about American Wine School. Get the latest in wine trends, tips and tastes by connecting with Marianne on Facebook, Twitter and Wine 2.0. Click here to subscribe to Marianne's Wine Blog.